Insulation is one of the most important aspects of your homes energy signature. Insulation, at its core, prevents the transfer of heat and cold between two differing environments or surfaces. Just like a cooler keeps your ice and drinks cold on a hot summer day, fiberglass insulation preserves the heat or cool in your home from the outside temperatures. This insulation, by both Johns Manville and CertainTeed, is Standard R13 insulation, which is the standard for 2x4 walls. (As it is 3.5 inches thick). This insulation comes in Kraft paper backed rolls that are pressed in to the studs of the frame and stapled in place to keep them secure. Since insulation uses fiberglass strands to trap pockets of air from moving to maintain a thermal barrier, insulation works best when it is not compressed or stuffed in a cavity and can take its designed shape and density. All exterior walls are insulated in this fashion to provide an energy efficient barrier against the outside world. A side effect of this is also a guard against the noise of the outside world as well, as fiberglass insulation blocks noise fairly efficiently. One unfortunate issue is that our builder chooses not to insulate the interior walls of the home. This has little effect on the heating and cooling, but a significant impact on sound transmission. With the drywall up, it is very difficult to install standard rolled insulation without taking all of the walls down. One good solution is to blow in loose fill insulation with a machine. This is fairly cost effective and can be preformed with a minimum amount of work and drywall patching, as the nozzle is typically only 1 inch in diameter. The final area to get insulation is the attic space. This space will be filled with much thicker insulation to prevent thermal transfer between the rooms of the house and the attic. A crew will arrive after the dry walled ceilings are installed to perform this process, as there is nothing to hold the insulation in place between the rafters until this is completed. A new house is usually the biggest purchase that a person can make in an entire lifetime. Over time, your newly acquired home will be filled with almost all the material things that are important to you and your family. Aside from the structure itself, the value of all the material possessions in your home can also be staggering, and it is logical to do everything possible to protect all that investment. Aside from insuring your home and everything in it, there are "other" important things that need to be done to protect the house which people tend to overlook and neglect. Home insulation is one of them. It has a direct bearing to your energy consumption and how your home is heated. What is home insulation, anyway? Home insulation is necessary to manage the attraction of cold air and the transfer of heat. Cold air has a natural attraction to warm air in a similar way that heat from warm objects are attracted to colder matter. If your house is not well-insulated, continuous use of energy will be required just to provide heat to your home. When properly insulated, the attraction of cold air and the outflow of heat will be restricted. 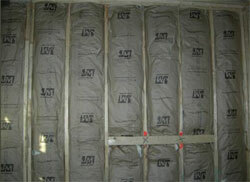 Home insulation is therefore important to maintain the warmth inside the house while limiting the heat that gets out. The principle is similar to wearing a glove to keep your hand warm while holding a block of ice. Because of the glove, you hand remains warm and no chill is felt even when holding it against the ice. Proper insulation minimizes the infiltration of cold air into your home to keep it warm. It is therefore important to take care of it before having a home heating system installed. It can be very costly to have a continuous supply of heat that is unnecessarily lost because of inadequate insulation. This will also take its toll on your heating equipment. When insulating your home, it is important to remember that one with a simpler form such as a studio-type building is less expensive to insulate than one with a complicated form. Be that as it may, all buildings require adequate insulation not only to ensure supply of good quality of air, but to eliminate water vapor and to prevent growth of bacteria as well. Bulk insulation and reflective insulation are the two main classifications of thermal home insulation. The bulk type includes polyester, fiber, mineral wool, and polystyrene while aluminum and aluminum foil belong to the reflective group. For some under-the-floor installations, various materials may be combined into a more composite material. Bulk Insulation - This type of insulation works by trapping the air within the structure which involves a simple process of preventing the transfer of convected and conducted heat. The numerous air pockets enable it to control the thermal transfer of heat regardless of which direction the heat is flowing - very similar to how an efficient ski jacket works. Reflective Insulation - This utilizes high reflectivity and low emissivity to resist radiant heat flow. Reflectivity is the ability to reflect light waves while emissivity is the ability of a particular material to release heat. Iron, for example, possesses high emissivity while as opposed to aluminum foil. This means that the foil is better equipped to reflect radiant energy. However, the heat direction can cause the thermal resistance of the material to vary. The best resistance is under the source of heat, which is one of the reasons, why this material is often used for insulators installed underground or below the floor. Home insulation is a necessary ingredient in any home. It is beneficial to research different types of insulation. It is also important to know where insulation should be installed in your home. Check with your local building supply stores for more information that may help to guide you in successful installation of insulation in your home.